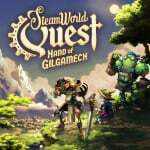 Image & Form's latest project SteamWorld Quest is just ten days away from release on Nintendo Switch. If you're as excited as we are, you'll likely want to check out this lovely new video from Nintendo Minute. Featuring around ten minutes of gameplay footage in total, the video takes us through how the game's deck building works - a brand new element for the SteamWorld series - as well as a good look at the battles themselves. There are several interesting mechanics in play here, including the use of cogs to power your cards and combining three cards in one attack to be presented with a bonus fourth card, and the whole thing looks like it could be another great entry into the series. Naturally, we'll make sure to share our full impressions of the game in a review a little closer to the game's launch - make sure to keep an eye on the site for that one! Day one. I have complete faith in the devs making a game that feels great to play. 10 days cannot pass soon enough. The game looks pretty fun! Reminds me a bit of Baten Kaitos, although I&F definitely did their own thing here. Haven't played a bad SteamWorld game yet (never played the tower defense game), so hopefully this keeps up the trend. Day 1 for me, I absolutely love the Steamworld series so I'll be preloading this as soon as I can! Checking it out, all my doubts are gone. This looks great and I'll definitely grab this when the physical release comes. I already played it yesterday. Not as fun as previous Steamworld game. It's just a regular turn based RPG using cards as mechanics. Similar to Smash Bros Ultimate using cards in the World of Light. The randomness is the shuffle of cards vs the roll of dice that typical RPG uses to determined damage and defence. Chaining 3 cards from a single character creates a combo, which is neat but depends on luck not skill. There are so many great games coming out in the eShop this month but this one has the highest priority of them all for me. Definitely playing it day one. really unsure on this never played a card rpg before and it looks a little slow (although that may just be the gamers in the video), love the dig series though so maybe will just wait for a decent sale. Even if the gameplay might not be my thing (have to try it first), I will finish this for the MUSIC alone. It was SO GOOD in both Steamworld Dig games. Yum! I thought I was interested, then I watched this video. 0 interest now. Guess my duckets will go to RESIDENT evil coming May. @quinnyboy58 Apparently there is a fast button that you can use on the map and in battle to speed things up. I don't know how much it does though. Can't wait to enjoy this game. I trust Image&Form to have made yet another great Steamworld game. If anyone could get me to play a card based video game, it's the Image & Form team. I’m still conflicted on this one. 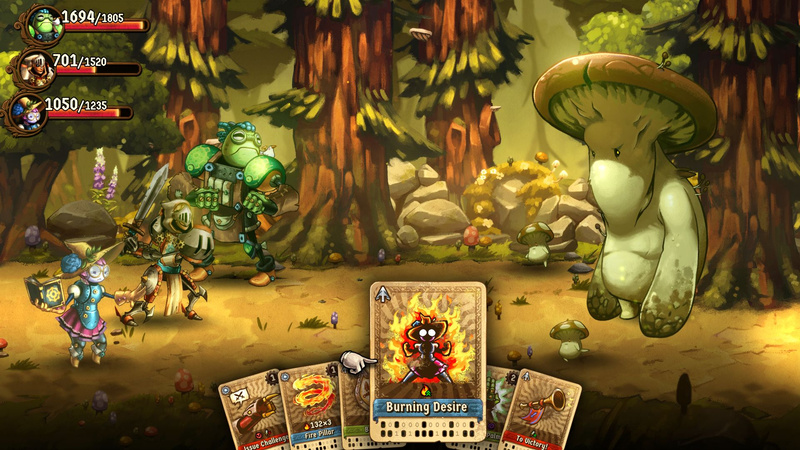 I’m not a fan of card RPG’s, but I love the SteamWorld universe. I’ll most likely pick it up if nothing else than to support I&F so they can make more SteamWorld games. Hopefully I won’t be disappointed. This looks great. I just picked up Moonlighter (which is a lot of fun so far) on sale but will add this to the backlog. @KlaooKun Hi, Brjann of Image & Form here! Thanks for noticing, but the game is actually cooler than the pic shown here. In the game, each card has its own sequence of ones and zeroes = unique and consistent punch-card patterns. (The cards shown here are from an earlier version, where all cards had the same pattern.) Super nerdy and overly detailed perhaps - but we're super nerds and we obsess over details! @imageform I love it, I am getting this day one! As I'm a game QA myself I love every single bit detail each game has to offer. With regards to the punch-card pattern, even better as it gives that extra touch of steam punk to the game. I look forward to playing it, same as your current and future games. Congratulations to the whole team and I look forward to seeing the much cooler build soon (25th)! @KlaooKun Haha yep! And thanks to everyone else here as well for your positivity. I just love hanging around here! I can't wait to see where in the chronology of SteamWorld this game fits in. I'm also personally hoping for physical releases of SteamWorld Dig and SteamWorld Heist on the Switch at some point! Even curious to see if Limited Run Games' upcoming 3DS titles may even include the SteamWorld titles. @imageform Hi Brjann !! Do we know roughly how long is the story in hours until you beat it? Thanks! Looks pretty good, still curious to see how this will balance out planning vs luck of draw, but so far I enjoyed all the Steamworld games quite a bit, so I'm pretty confident, that I'll get this and have a good couple of hours with it. @PerishSong There are few games I wish for more to make a comeback on the Switch than Baten Kaitos. The very least they could do, is give us a HD collection or even a 'VC' Nintendo Online release. I’ve never played any of the steam world games but this looks really interesting did you need to play the previous too follow the story or are they all different ? @nkarafo Hi, it took me 22-23 hours on Regular (there are different difficulty settings). But mind you that wasn't the very, very final build. Some elements may have been rebalanced after my last playthrough. Also, I love strategy and spent quite a bit of time "perfecting" my crew's decks. No matter how you play it, I think the story is wonderful and getting to the end was great. I finished up at 3:30 am, cried a bit and went to sleep.